This system had a complete preventative maintenance completed. It was tuned and calibrated to OEM specs and set up by certified engineers. All parts replaced are OEM parts. Please view attachments for service report and instrument performance report. Inspection and single sample testing is optional for interested buyers. Attached is a full report of the instrument testing and reporting after the preventative maintenance was completed. This instrument is in great condition! 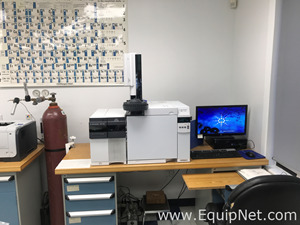 The Waters SYNAPT G2-Si High Definition Mass Spectrometry provides complete characterization of complex mixtures and molecules with unique levels of MS performance, industry leading informatics and unparalleled platform versatility. Through high-efficiency T-Wave™ ion mobility user can get superior separation, enhance the peak capacity, specificity and sensitivity of the analysis and transform all targeted and untargeted workflows. Ultimate UPLC/MS/MS performance, data independent and data dependant T-Wave IMS solution, CID and ETD fragmentation capabilities and a wide range of experimental options. This system gives user an additional dimension of separation, based on molecular size and shape. It delivers a third dimension to your analysis, proven to transform your analytical perspective whatever the application. Warranty: This is a 60 days Parts only warranty. Labor charges will be the responsibility of the instrument owner. Warranty is only valid within the USA. For more details regarding terms and conditions pertaining to the 60 day parts warranty and how it work inquire within.